While hiking above Maligne Canyon in Jasper National Park in Alberta, Canada, we stopped to watch some kayakers brave the rapids in the Maligne River. It took about 10 minutes for the young man in the white kayak to muster the courage to ride the rough river. All the while, his friends downstream shouted encouragement and advice. At one point before he took off, the kayaker noticed that Theresa was watching him bury his head in his hands. 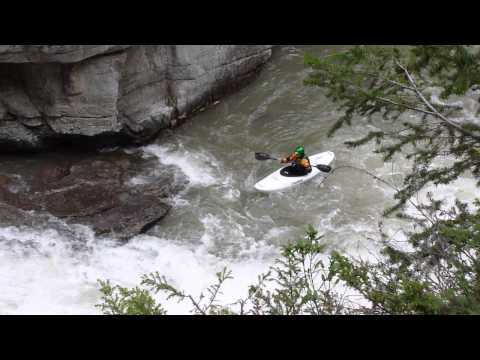 He yelled to her, “I’m not afraid!” And sure enough he wasn’t, as this video shows the kayaker moments later expertly navigating the rushing waters.